Huestis Medical’s Selectable™ Collimator (CM-2200) provides pre-formatted sizing selection without the complexity of traditional automatic PBL systems. It allows technicians to easily select film size and SID (Source-to-Image Distance) directly from the front panel. Choose our CM-3200 Series which includes the features of the CM-2200 with the addition of discrete communications and on-board PBL capabilities or our CM-3201 Series for serial controlled units (from custom software provided by customer) in a choice of RS232, RS485, or CANBUS protocols. Our CM-3300/CM-3301 Series collimators add an IRIS shutter layer for fluoroscopic imaging applications. Special orders for remotely controlled under-table models are also available to complement a wide range of applications tailored to your radiographic needs. Provides technicians with easily selectable pre-formatted film sizes and Source-to-Image Distance (SID) directly from the front panel of the collimator. Micro-controller electronics are self-contained in the collimator head, eliminating problems with complex remote electronic logic and cabling. Weighs only 14 lbs (6.4 kg), requiring significantly less counterweight for improved performance. Direct coupled drives eliminate mechanical backlash common to other designs. Modular design and perpendicular flat collimator blades increase reliability and facilitate quick servicing. The entire collimator can be disassembled and serviced in minutes. 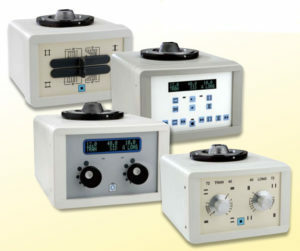 Huestis Medical’s RE Series (CM-4200/CM-4201) provides a rotary input interface solution with the same reliability available throughout the Huestis Medical collimator line. Choose our CM-4200 Series, a motorized manual with rotary knob interface and keypad Source-to-Image Distance (SID) selection capability. Our CM-4201 Series is equipped for serial control (from custom software provided by customer) in a choice of RS232, RS485, or CANBUS protocols. The rotary input interface allows on-the-fly field size adjustments by the technician. High performance “fly-by-wire” rotary input controls allow the technician to easily adjust film size without having visual contact with the collimator front panel or controls.